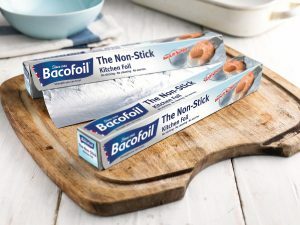 Iconic foil brand, Bacofoil, is back on TV, investing in an ATL sponsorship campaign across ITV’s Sunday morning cooking shows to support its Non-Stick Kitchen Foil. The exciting ITV Sunday cooking segment will provide the UK with a variety of recipes and showcase exotic locations with Ainsley Harriott’s Caribbean Kitchen and Parveen Ashraf’s Indian Kitchen, the perfect fit for Bacofoil’s foodie audience. Launching on 20 January, the sponsorship campaign will run for 10 weeks with spots every Sunday across two 60 minute episodes. The ads will highlight that everyone needs a friend in the kitchen – Bacofoil The Non-Stick Kitchen Foil. Along with further planned TV activity in April-May 2019, the new sponsorship campaign will mean continued brand investment for Bacofoil with a strong TV presence throughout four months of the year. In addition to the campaign, Bacofoil has a variety of brand activity planned including PR, sampling and commercial initiatives. During its previous TV advertising campaign for The Non-Stick Kitchen Foil, Bacofoil saw a 12 week value sales increase by 18.5% YOY. The unique BacoLift surface on The Non-Stick Kitchen Foil provides a hassle free solution to the age old problem of food sticking, instead food looks as it should. With no need to use oil or butter, it’s also a healthier alternative for consumers. Plus it saves on the washing up afterwards. Bacofoil’s The Non-Stick Kitchen Foil has an RRP of £3.20 for 10 metres.